Last night the Miami Heat demolished the upstart Chicago Bulls on their home turf 115-78 to ease into a 1-1 tie in their NBA Eastern Conference playoff series. During the game, noted Bulls hot–head Joakim Noah got into it with a zebra and got tossed for his troubles. As he exited to the locker-room, a Miami couple charged the guard rail to the tunnel and, well, as you have probably guessed by now, the above happened. It should first be noted that the Heat were winning by 37 points at this point. Imagine these imbeciles reactions if it had been closer. To focus on the main element of the picture, the Miami woman who is so gleefully waving her middle finger in Noah’s face, it would be interesting to know how long it took her to sprint down from the luxury club suites. 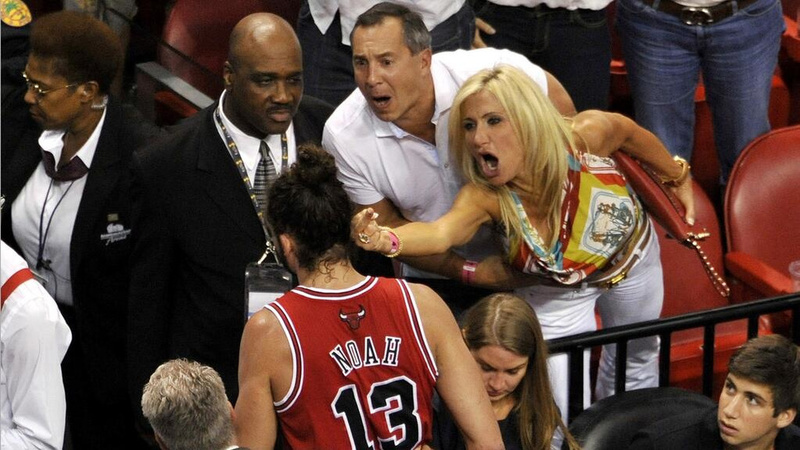 Whether they like it or not, this woman is now the face of the Miami Heat fan base. Before we appear to be too eagerly driving the knife in here on Heat fans, please bear in mind two things. First, before the ‘Big Three’, Heat games had all the atmosphere of a funeral. Heat playoff games were just as bad. Pre-LeBron, as the Celtics spanked Miami out of the playoffs, their home playoff games were laughably attended. Second, it has to be remembered that the Miami Heat are the same team that recently had to send out a flyer telling their front-running fans how to act at NBA games. No, seriously. On a somewhat serious note, huge kudos must go to Noah for remaining composed in the face of such arm flab waving hatred. You stay classy, Miami, you stay classy.